So you’ve decided to do something about that outdated or unsightly backyard, and now you’re left with a pile of broken concrete that needs to go. What’s worse is that the City of Toronto doesn’t do curbside pickup of concrete, and none of the Garbage and Recycling Drop-Off Depots accept it. What can you do? As long as the concrete is clean fill, that is, it’s unreinforced and doesn’t have re-bar, there’s a few cost effective solutions you can use to get rid of it. If you have a means of hauling the concrete waste, you can bring it to the Leslie Street Spit for a flat, tax-free $33 fee. The landfill is open Monday to Friday from 7:30am to 4:15pm. This is the best option for residents in the Downtown Core and surrounding areas. You’ll need a pick-up or truck capable of transporting the waste safely, and we should mention that multiple trips will require paying a fee for each time the Landfill is entered. If you’re a York Region resident, the McCleary Court location accepts unreinforced concrete. They are open Thursday to Monday during the summer from 9:30am to 4:30pm, with extended hours until 7:00pm on Thursdays. Fees start at $10 for cars or vans, and go up to $30 for pick-up trucks. Finally, for large or heavy loads, or if you do not have access to a method of transporting the concrete, consider using a private waste removal company for your concrete disposal. The major advantage being that it will take you a lot less time to get rid of it. 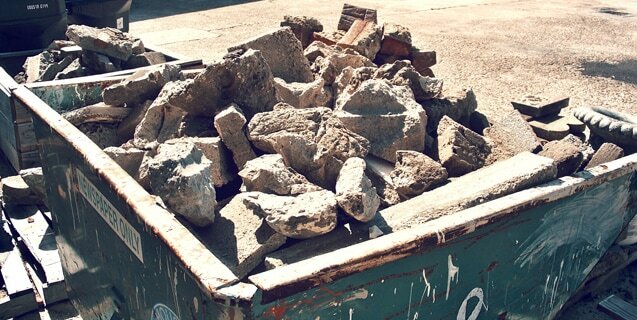 With prices for bins starting at just $250 – Greenbelt Environmental Services can make the job of disposing of your concrete waste much easier.